Bathroom mold removal is among the least desirable chores in the house. 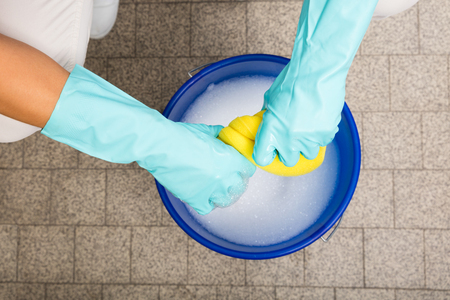 Use protective gloves when removing mold and mildew to protect your hands from the strong cleaning products. After all, when faced with the ominous-looking black growth between tiles on caulk, who hasn't been just a bit tempted to cut and run?! If that could solve the mold and mildew mess, I'd cut and run with you. Alas, once we returned we'd likely find this living menace to clean society had taken over the bathroom. So instead of heading for the door, let's just deal with these nasty interlopers now and send them packing - stat - so we can stay put. Start by opening the window, if you have one. If you don't, grab a fan and position it so that it blows clean air from other rooms inside. You'll be using bleach for thorough bathroom mold removal, and you'll want keep the fumes in this small room to a minimum. Put on your reusable waterproof cleaning gloves then mix a mold removal solution of 1 cup bleach and 1 gallon water in a cleaning bucket, like this $15 model from OXO. Swirl it around gently with your gloved hand, making sure none of the solution splashes out onto nearby surfaces. While bleach is a key player in bathroom mold removal, it can also remove color from carpeting and bath mats - a rather undesirable possible side effect. So be sure items in your bathroom that could be stained are removed or covered before you begin. If you have carpeting outside your bathroom, plan your post mold clean up so that there's no chance of dripping the cleaning solution on your way out. This second bucket will hold the water you use to rinse away the mold cleaning solution. Using a bathroom scrub sponge or rag, apply the mold removal mix to walls, tile or grout - wherever mold has grabbed a toehold. Let the solution to sit on surfaces with mold or mildew for at least 15 minutes to allow it enough time to do its job. Rinse the bleach solution completely from the tile or grout surface, using the second bucket of clean water. Dry the cleaned areas in your bathroom completely. You can use old rags, paper towels, or a fan. Repeat the surface cleaning routine above if you can still see or smell mold or mildew after cleaning. Once the mold and mildew have been removed, consider using mold inhibiting solutions, such as vinegar, to regularly clean bathroom surfaces, especially walls and bathroom tiles. Keep bathroom humidity below 55 percent if you can. Don't become numbers-bound here; simply turning on the bathroom fan for 15 minutes after your shower or bath will significantly lower the bathroom humidity. Mildew-resistant paint or mold-killing paint primer, can also be applied to keep mold and mildew out for good.